The ocelot (Leopardus pardalis) is a small mammal, one of nine species in the genus Leopardus. It lives in South and Central America, as far up as Mexico. It has been reported as far north as Texas and in Trinidad, in the Caribbean. These fast cats eat small mammals, birds, fish, and snakes. They are very good swimmers. Once hunted for its beautiful fur, the cat is now protected and listed as 'least concern' by the IUCN Red List. The cat is nocturnal and likes forests and dense vegetation. It is very territorial, and will fight to keep its territory. Like many cats, male ocelots mark their territory by spraying urine. Their kittens grow slowly, staying with their mother for up to two years. They have to learn how to catch prey before they can be independent. Although a "small cat", it is a good deal bigger than the others. 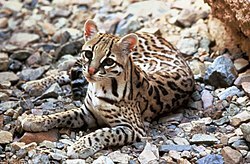 The ocelot ranges from 68 to 100 centimetres (27 to 39 in) in length, plus 26 to 45 centimeters (10 to 18 in) in tail length, and typically weighs 8 to 18 kilograms (18 to 40 lb). Larger ones have been reported. It is the largest of the generally dainty Leopardus wild cat genus. ↑ Moreno R.S. et al (2006). "Competitive release in diets of ocelot (Leopardus pardalis) and puma (Puma concolor) after jaguar (Panthera onca) decline". Journal of Mammalogy 87 (4): 808–816. doi:10.1644/05-MAMM-A-360R2.1. http://www.nysm.nysed.gov/staffpubs/docs/15933.pdf. This page was last changed on 20 November 2018, at 19:32.